From October 17th through 23rd, Bonefish Tarpon Trust worked with guides from the Abaco Fly Fishing Guides Association, Black Fly Lodge, Abaco Lodge, Delphi Lodge, and Pete & Gay’s Guesthouse to tag 339 bonefish on Abaco. We also surgically implanted sonic tags in 25 bonefish and placed sonic receivers at a suspected spawning location as part of a study to identify important spawning sites. That sounds like it was probably a lot of fun to be a part of, no? This is my guest post for Deneki Outdoors, the owners of Andros South. Love that place. Photo by Andrew Bennett, fish catching by me. While out stalking the phantom of the flats, it turns out you can do more than just catch and release. You can fish for science! 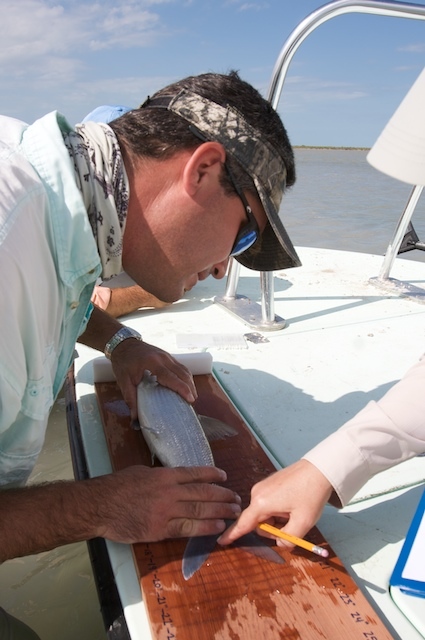 via Bonefish Science | Tagging and Fin Clipping Bonefish. 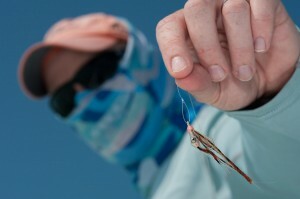 Tagging and fin clips… two great ways to help the folks at the Bonefish & Tarpon Trust. 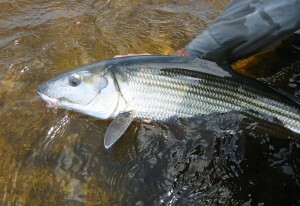 How cool… tagging bonefish for the Bonefish & Tarpon Trust in CUBA! That sounds kind of awesome. In mid November I had the opportunity to tag bonefish in Southern Cuba for the Bonefish and Tarpon Trust. via Slipstreamangling :: Extraordinary Waters Worldwide. Rich French, from Slipstream Angling is the lucky SOB who got to do the trip… see… he’s Canadian, so he gets health care, sensible gun control AND gets to go to Cuba. I hope they have as many Canada Geese as we have… that would at least be a mark in the negative box. Canada doesn’t have any of their own bonefish… I guess that’s a pretty good negative too. So, maybe it all balances out. As you may have guessed, I dig Skinny Water Culture gear. 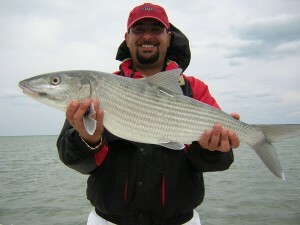 So, I was really excited to read on their blog about a bonefishing trip and a re-capture of a bonefish tag. Nice fish and nice tag. They got word back about the fish and it’s 658 days between tagging and recapture. Awesome. Bonefish tagging… it’s important stuff. 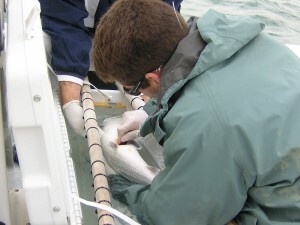 The Bonefish & Tarpon Trust does tagging as does the Bonefish & Tarpon Research Center at the University of Miami. Keep up the good work guys! When it comes to Biscayne Bay and bonefish a guy who will probably come up in conversation is Joe Gonzalez. Joe has been a guide for a long time, he knows the water, he knows the fish and he’s tagged more bonefish than I will ever catch. Joe and I recently connected via the phone for an interview. What makes the fishing in Biscayne Bay unique and what’s your favorite thing about the fishery? What makes Biscayne Bay fishing unique, unlike the mid keys or lower keys, our flats on the north end of the bay are not as large, not as big and you can jump from flat to flat with ease until you find fish, unlike most Keys flats and banks that are massive. We also have a very strong winter time bonefishery here, even when the temps drop below the mid-60’s. You can still find fish, usually in large schools and have a banner day with northerly winds of up to 20 mph. We have a gargonian type bottom, lots of sea fans and basket sponges and gargonian sponges and for some reason the fish like to hang out in those areas at that time of year. You find a lot of fish, but you break them off. Biscayne Bay, being at Miami’s doorstep with three million people, you would think the ecosystem would be in a deplorable state, but actually it is a pristine environment with a healthy fishery and plenty of food stores for the fish. 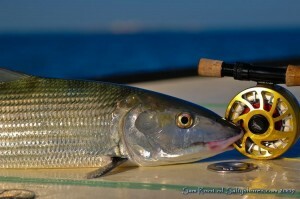 Biscayne Bay is known for two things… big bonefish and tough bonefish. Does Biscayne Bay deserve that reputation? 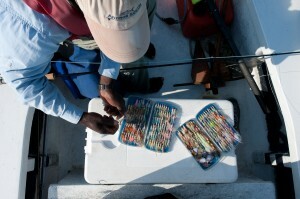 Yes, Biscayne Bay is not an easy fishery. Many think of calm, slick water and sunny days to be the best conditions. But ask most guides and they would usually prefer some wind and low light conditions. I myself love fishing in strong winds. The fish drop their guard and eat flies well. They move better and feed hard. If you look at the world record books, out of 187 world records, 127 of them were caught in the US, most of the world record fish were caught in the Florida Keys and Biscayne Bay area. A lot more people fish the Keys than Biscayne Bay, but 10 world record fish have been caught in Biscayne Bay. Not small... not small at all (nice tag too). 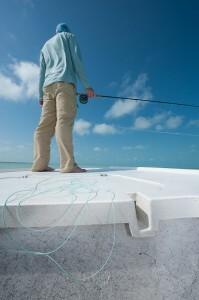 Most people go down to the Keys, Islamorada, to fish. Most of the time, people don’t think of Biscayne Bay or Miami. You usually get people when they are coming down on business and you get them on either end of the business trip. That’s how the start to learn about the fishery, for the most part. What is the state of the fishery? It seems like with the cold blast we had in January the fishery suffered a bit. We found that most of the affected areas were the back country parts of both Biscayne Bay and Florida Bay. The exterior parts of both Biscayne Bay and Florida Bay didn’t suffer as much as far as bonefish depletion. I fished hard for two weeks after the blast and the fishing was really good. It was somewhat of a relief to me and to others that there are still plenty of fish around. 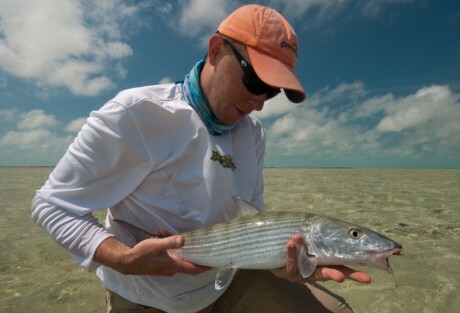 The press got a hold of some of the bonefish stories and exaggerated. Most of our outside fish ran offshore, probably to the Hawks Channel area and or deeper areas to take refuge when the surf temps dropped below 60. So yes, the fishery is not as strong as it used to be, but we’ll always be talking about how it used to be. 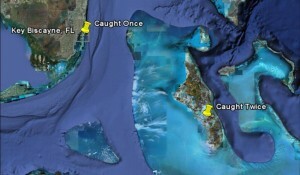 You’ve been involved in bonefish tagging for the University of Miami with over 1,300 fish tagged. What have you learned about bonefish through that work? It has helped understand their growth rates and movements. Working with Dr. Jerry Alt and Mike Larkin from the University of Miami Bonefish Research Program, we do an annual bonefish census and it gives us the number of bonefish. We learned that they live up to 20 years by taking the odilith and counting the rings, much like counting the rings of a tree. The oldest fish ever documented was about 20, according to Mike Larkin. 70% of the recaptures are within 2 miles. The tagging program gives us an idea about the number of fish, but it is more useful in letting us know about the movements of the fish. Mike Larkin putting in an acoustic tag. I don’t know if you are aware, there is a bonefish I tagged on February 11th, I believe, 6-7 years ago… the fish was at large 10 months and it was recaptured January 31st and it was recaptured in the middle bight of Andros. I’m very familiar with that fish. I didn’t know that was you! Everybody thought that Florida bonefish were only found in Florida and that the Bahamas fish were only in the Bahamas and the Mexican fish were only in Mexico. They thought all these fish were different, separate bodies of fish. With that one fish being found down in Andros (and Kenny Knutson our of Islamorada tagged a fish 2-3 years after my fish and it was also found over there in the middle bights of Andros), so there may be a genetic link between Florida bonefish and Bahamas bonefish with that fish making a trans-Atlantic crossing… it was the longest recorded migration at 187 miles, but it was a trans-Atlantic crossing, the fish had to cross the Gulf Stream. The closest point to where this fish was tagged is Bimini, which is 48-50 miles across the ocean and once the fish is in Bimini it is up on the Bahamian Bank. I was invited by Venezuela, through the University of Miami, to fish in Los Roques and introduce the same tagging program we have here in Florida. The asked me to go, I packed and went. The fishery down there, the different camps and lodges and guides, it isn’t a happy place… folks don’t get along. I was able to go down there as kind of an ambassador. I speak the lingo, I speak Spanish fluently and I was able to go down there and make some peace between these guys and help everyone get on the same page and help everyone realize that by tagging bonefish, it is making the whole business down there a little bit more environmentally friendly. They were very receptive and with me being a guide they were able to relate to me. I was on their same level. It was a real good experience. The main guy that pioneered the bonefishing down there is a guy named Alex Gonzalez. People either like him or hate him. They’ve started a tagging program and they are starting to be able to estimate numbers, get growth rates, and do what we’ve done here. It was great being down there. When I went down there I thought it was going to be easy. I’ll tell you what… it was hard to get the fish to eat. When I was on my own… now, I know how to strip, I know how to feed a fish… I thought, but I’d try it and they’d spook and I’d work with one of the guides and they knew how to read their fish better than I did because they were their fish. It was crazy. It’s like starting all over again. It showed me that there are things you know from being on the water that are special and unique to each place. Nice FL bone with a dark, dark back. The more you are on the water, the more odd and unique things you get a chance to see. What’s the wildest thing you’ve seen out there? One of the weirdest things I’ve seen is bonefish being prayed on by porpoise. 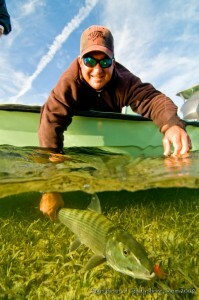 I’ve seen propose corralling bonefish up on the flats and it’s not a pretty sight. It’s interesting, because it is nature taking its course. It is the only time I’ve seen bonefish coming out of the water and not bibbling, as they do in the Bahamas (kind of a rolling thing that bonefish sometimes do). When a pod of porpoise were chasing a school of bonefish and I saw a couple of bonefish go airborne trying to escape. Bibbling, I’ve seen that down in Los Roques too. Bonefish sometimes, when they come off a flat and they are in a deep channel, they’ll do what they call in the Bahamas “bibbling,” kind of a rolling on the surface. Another thing, they say that bonefish are really spooky and guides and anglers get upset when boats run close by and spook fish. Believe it or not, there are flats that have a lot of boat traffic, especially on the weekends, but the fish have evolved to get used to the noise… believe it or not, I’ve caught fish on flats despite having boats up on the flats because the wakes from the boats loosed the bottom and it makes it easier for the bones to find shrimp, crabs and crustaceans I’ll tell my anglers to look for the muds in the muds. I’ll be on the edges of the channels and the boats will come by and create a lot mud, but the fish are in the mud making mud. You are in fresh mud looking for new puffs of mud. It’s kind of weird telling my anglers to look for mud inside mud, but when you find it, it’s a gimme. One really weird thing… and this was real… I was out with a friend of mine off of Key Largo in the early 90’s and I saw a bonefish with its head out of the water. It looked like it was walking on its tail. We approached it slowly, thinking it was dying or dead, but when we popped up next to it, it swam away… and no, I wasn’t high or drunk. Never, ever have I seen a fish doing that. What’s your most memorable bonefish? My most memorable bonefish… I was fishing with a guy named Mike Swerdlow, who’s been doing it forever with some of the best guides in the Keys since the 70’s. Mike’s the kind of guy that, when fishing together would screw me up a bit because he wouldn’t let me get close to the fish so he could make a 70-90 foot cast and usually that isn’t a high percentage shot with most of my clients, but Mike is different. He wants the hero shot, at 100 feet, and what’s funny, is that he can make it. We were fishing an area in Biscayne Bay called Feathervit Bank in the early 90’s when there was a fair number of big fish in that area and we spotted a single fish, up on the bank, tailing. We had been fishing deeper water for mudding fish so he had on a relatively large epoxy fly that was popular back then and was too heavy to throw at tailing fish, but he asked me pole up to that fish and give him a try. It was a small window of opportunity and we didn’t want to lose it. So, I went ahead and polled up to the fish, but I told Mike the fly was inappropriate, but he insisted on not changing the fly that would have been far better in 2.5 feet of water as opposed to 12 inches. He made the cast with that big epoxy fly and put it about a foot from the fish with a big plop and the fish jumps on the fly, runs 100 yards west on the bank with the line making a bonefish rooster tail all the way. I wish I could have videoed that fish. It is still vivid in my mind. It is moments like these that we live for, dream about and spend countless amounts of monies and time for that feeling. The tailing fish…. One solo fish… back out of the water fish… that’s the highest, the pinnacle… and to do it with the wrong fly on a long cast… it was that scenario… never in a million years would I think the guy was going to catch the fish… and to have it happen and it was probably an 11-12 pound bonefish. I’ve been using the Nautilus Featherweight. I love those reels. As far as rods, I’ve been using the S4S in an 8 wt. with a matching Nautilus reel. Thanks for the great interview Joe. Great stuff. Additional thanks to Sam Root of Salty Shores for some of these pics. 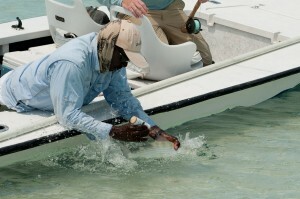 After less than a year, a tagged bonefish has been re-captured off Abaco. That’s the work of the Bonefish and Tarpon Trust for ya. You should be a member… if you are reading this you probably want to catch bonefish in the future and the folks that are doing the science to figure out what areas even need to be protected are the Bonefish and Tarpon Trust. OK… you have a tagged bonefish. Congrats. Now what? There ya go. Now you know. Photo courtesy of Aaron Adams. 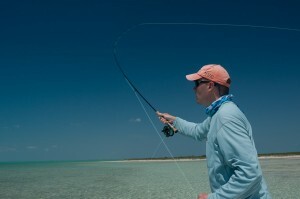 Aaron Adams and BTT are everywhere, carrying the water for most of us who love, like or otherwise fish for bonefish. Found a story from the Miami Herald. BTT went down and met with Bahamian guides to discuss increasing participation in the tagging and reporting of tagged fish. Read the story here. How long is your commute? I once had to drive 100 miles, but only had to do it twice a month. Mr. Bonefish, it turns out, can put in some serious miles. 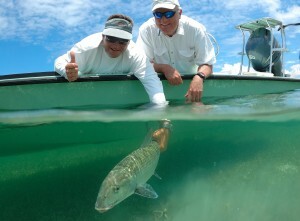 Florida has a tagging program thanks to the Bonefish and Tarpon Trust and the Florida Keys Fishing Guides Association. One of those tagged fish was caught and tagged near Key Biscane. From there it crossed the Gulf Stream (something researchers didn’t know they did) and was caught off Andros, about 186 miles away. 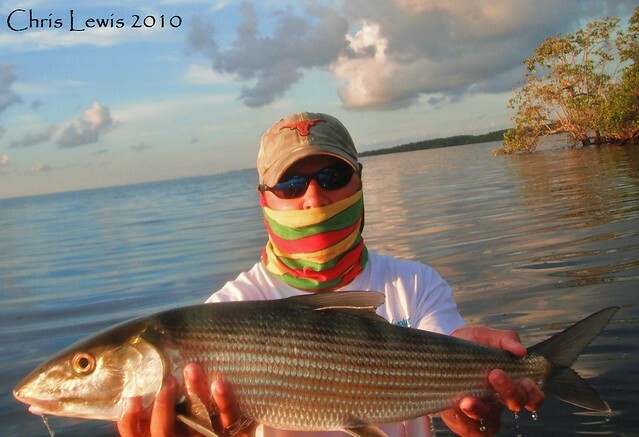 This more than doubled the longest known movement by a bonefish. This has all sorts of implications… it means Florida bonefish may be intermingling, and maybe interbreeding, with Bahamian bonefish. Here is the news from Science Daily.